Ken started building my guitar in 1965, although he did not know it at the time. In 1965 lumber mill scouts in Honduras' Chicibul jungle located a “magnificent mutant,” a mahogany giant, and cut it. Because of the way the cut tree fell and its overwhelming size, it was not until the early 70’s that a company with heavy equipment pulled the tree in sections from the rain forest and sawed it into boards. This was the beginning of the legend of “The Tree” which is described in an article by Mark Berry in the 1985 September/October issue of Fine Woodworking magazine. I had also read about “The Tree” in an article by Bob Taylor some years ago. George Lucas, creator Star Wars, apparently had his office in San Francisco paneled with it. Ken indicated that he had managed to obtain 3 sets of “The Tree,” an auspicious and fortunate beginning to a great guitar. He called it “Brazilian favored mahogany.” We agreed that he would bring the wood to Kamp for a preview, including a “surprise” top set. So, I first saw my new guitar -- wooden pieces stacked next to the sink between the Kamp doctors’ rooms in Carnegie, the beginning of # 118: thin ribbons of dark Brazilian binding, a chocolate and caramel piece of Brazilian veneer, a long thin strip of black Ebony, two pieces of the dark, hard, glassy “Tree” with big quilt and three-dimensional figure even unfinished. 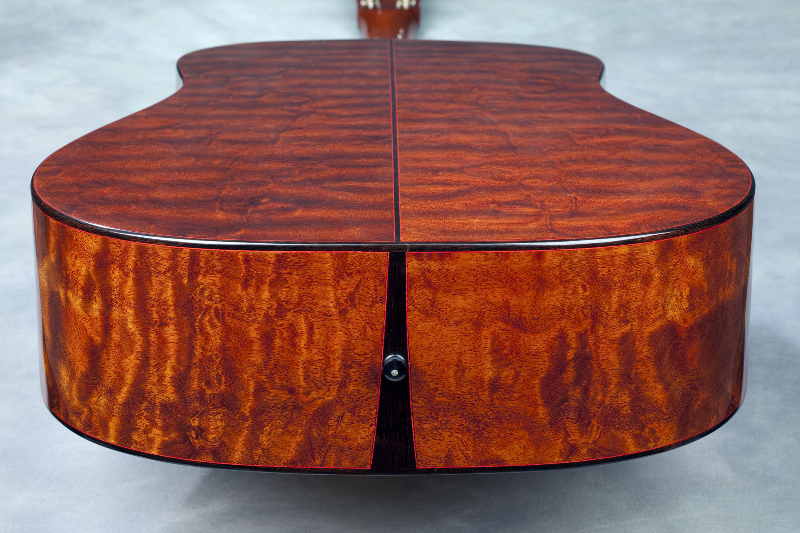 The surprise top was an extremely rare piece of wide-grain Adirondack spruce with bearclaw. I don’t mean red spruce with occasional spots of bearclaw here and there, but top to bottom symmetrical bearclaw carved into the plank-board, wide grain. Add to the fine collection of stacked wood pieces, stainless steel fret wire, mother of pearl pieces, oil varnish, and a set of hard-to-find “Tony” turners from Stew-Mac. We agreed that he would work to deliver the finished guitar by Christmas. Two weeks before Christmas I received a note from Ken. “Poor news” the e-mail read. Ken had carved and mounted the neck, and he did not like something he saw in the neck wood. He decided to fashion a second one. This meant no Tree for Christmas. I was disappointed by the timing, but I was also pleased. I took this as another positive indication of Ken’s need to create the perfect neck for the already perfect body, without flaws or doubts. As it sits on my guitar stand now, I see stunning perfection, understated at a short distance, but full of marvelous details when held up close. I’d forgotten about the highly figured, Brazilian bridge mounted with hand carved walrus ivory pins with matching end and strap pins. There is no guitar like it, and probably nothing like it again. How does it sound? Right out of the box, it was loud, focused, and commanding -- a guitar for playing lead. The trebles ring clear on all frets. 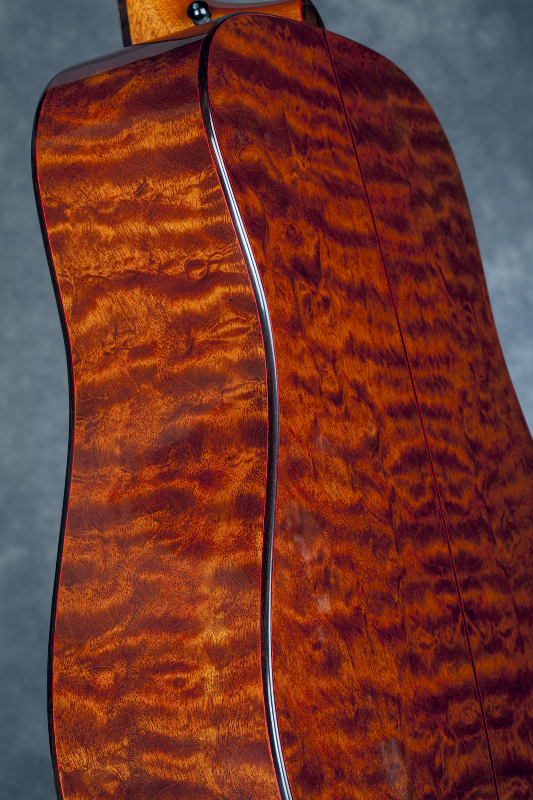 The bass is dry mahogany, but a bit darker and richer than my other mahogany guitars. Ken’s guitars have a light build, the kind that delivers rib rattling bass from the back. The mid’s are really indescribable. They are not bluegrass mid’s but strong and cutting nonetheless. 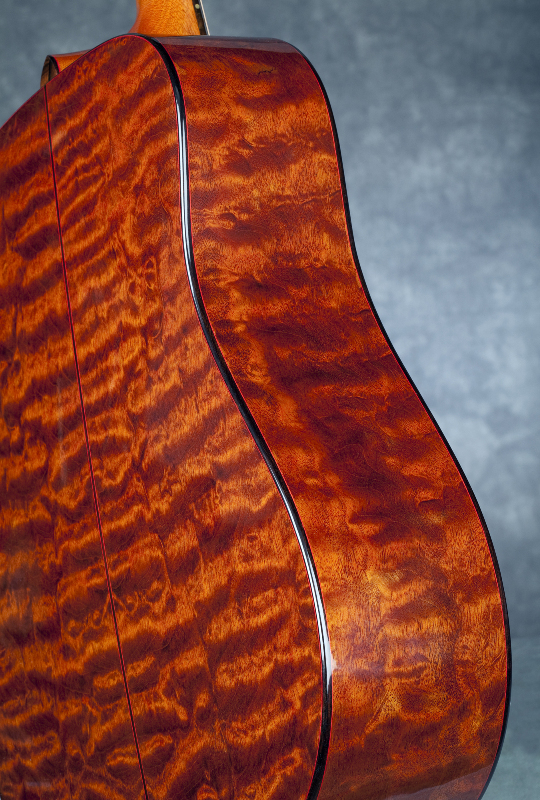 I attribute this special mid-range to the dovetail neck joint, a construction that delivers the open “G” note the entire length of the guitar. The setup of the Les Paul-shaped neck is perfect. A fine red line of wood separates the ebony fretboard and the Brazilian fretboard binding, pearl fretboard dots, and still more visual subtlety to distract me when I look down." 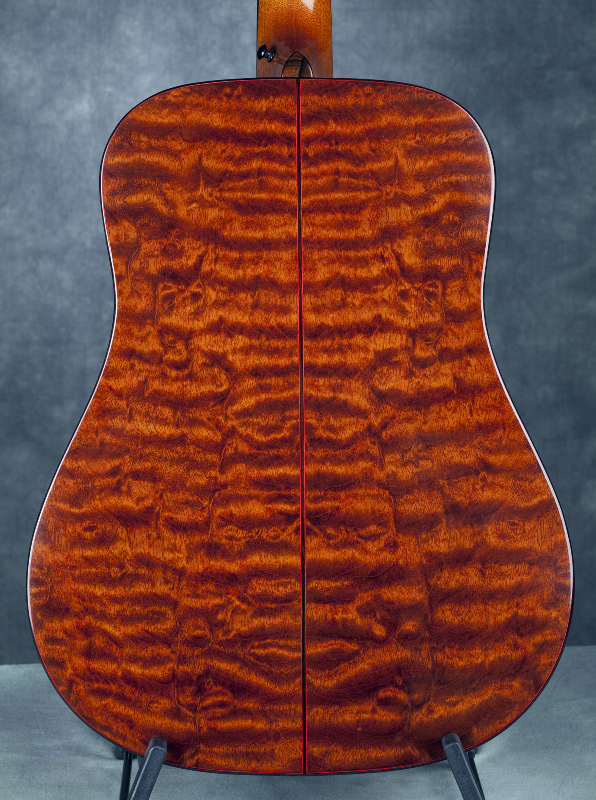 The back and sides are darker than most mahogany and with enough big, 3-D quilt to make a sailor seasick. Most of the expense of the guitar is in the back and sides. The varnish finish delivered all the excitement and beauty I expected. Doubtless finer and more expensive guitars have been built, but today none finer in sight or sound than #118. Thank you Ken and Virginia."